Steven Spielberg's imaginary childhood friend brought to life, voiced by an aging actress with a two-pack-a-day cigarette habit. Everett Collection E.T., Henry Thomas, 1982. Stars: Henry Thomas, Dee Wallace, Robert MacNaughton, Drew Barrymore, Peter Coyote. Steven Spielberg’s imaginary childhood friend brought to life, voiced by an aging actress with a two-pack-a-day cigarette habit. In this boom time for space fantasies and ghost stories, Steven Spielberg has scooped his colleagues by coming into town with an example of each. He has thus won himself two full-dress salutes in the Sunday New York Times and has preempted movie houses all over the city. Poltergeist and E.T., Spielberg tells us, spring, respectively, from the dark and sunny chambers of his childhood imaginings. They spring also from innumerable fictions, print and film, of the remote and recent past. Spielberg’s is not a conspicuously inventive mind; it is, however, creatively acquisitive, and I believe that his popular appeal rests considerably on his effective reworking of familiar material. Like riders on a roller coaster, the viewers know what to expect, they whoop and clutch one another in happy expectation. Poltergeist warns us that if we trifle with the last resting places of the dear departed, they will express their resentment in a variety of horrid ways. This suggestion, reasonable enough if you hold with the posthumous persistence of identity, is as old as Edgar Allan Poe. In this case the ghosts emerge through the screen of the Freeling family’s TV set, which is tuned to an unoccupied channel, the station having signed off for the night. (This is one of those households where the set is never turned off.) Once out of limbo, and their complaints still unattended, the wraiths progress from table-stirring and chair-stacking to creating gales, abducting a small girl, manifesting themselves in guises that recall the Jabberwock and other goggle-eyed, slavering anomalies. Their discontent reaches a climax during a torrential storm, when the earth heaves and the graves give up their dead. The noise, on screen and in the audience, was deafening. What pleased me in Poltergeist was the vain attempt of Dr. Lesh (Beatrice Straight), a thoroughly scientific investigator of paraphysical phenomena, to cope with the rampaging spirits. They scare the wits out of her, and she has eventual recourse to a diminutive medium with a high and commanding voice (Zelda Rubinstein), who is not at all cowed by the boisterous aggressions of the restless dead. When it comes to exorcism, incantation outscores electronic scanning. Spielberg wrote Poltergeist and produced it with Frank Marshall. It was directed by Tobe Hooper, known to movie buffs for The Texas Chainsaw Massacre, but it is being billed, perhaps unfairly, as a Spielberg picture. The fact is, it feels like one. 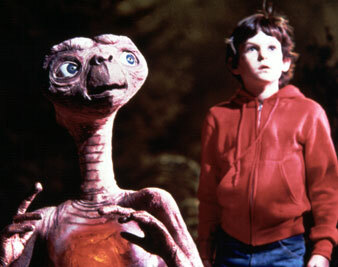 E. T., which Melissa Mathison wrote from notes by Spielberg, is the classic children’s story of a boy and his pet. Frequently in such tales the stalwart lad, sandwiched between a sassy younger sister and a scoffing older brother, has become somewhat subdued and lonely. Then along comes a puppy with a sore paw or a colt that no one wants, and life looks up. For Elliott, however, the newcomer is a two-foot high, leathery and turtle-faced chap with gentle manners, a telescopic neck and an ability, that he exercises with modest discretion, to subvert the laws of physics. A UFO has landed in a patch of California forest. Its crew members hop out and scurry about excitedly in the dark woods, their bellies lighting up like the thoraxes of fireflies to show the way. Suddenly, men appear with flashlights. The extraterrestrials streak back to their ship and take off in such a rush that one of them is left behind. Next evening Elliott comes upon E. T. in the toolshed, and the tale of mutual trust and mutual affection begins. The problem, a kind of comic suspense tale, is how to care for E.T. without allowing any adults (and particularly some government security people who suspect his presence) to set eyes on him. Elliott enlists his sister (Drew Barrymore) and his brother (Robert MacNaughton) in the project and for a time they succeed, thanks to luck and a quickness of wit that will delight other children. But the alien, though fond of his young friends (his own age is incalculable), is mortally homesick, and earth’s dirty air is doing him no good. He falls sick and the experts track him down. A bewildering profusion of equipment is rolled up to the house; doctors and nurses poke and pry and cover E.T. with tubing, and under their intensive care he draws his last breath–or seems to. The story creaks a bit here, but I gather that a message from space revives the moribund patient. Aided now by a phalanx of boys, he escapes from the impromptu emergency ward and makes it back to the forest and the returning UFO. It is a wild chase, with prowl cars pursuing a platoon of bikes. At E.T.’s urging, his rescuers’ bicycles take to the air in a glorious flight that exceeds the happiest dreams of earlier generations raised on Peter Pan. The final scene is blatantly sentimental, but then the whole film is a triumph of sentimentality–a joyous fantasy in which the children’s determination to befriend a stranger outwits their elders’ desire to know what makes him tick. Spielberg works well with children, but never before has he directed them with such reticence or such appreciation of their humor, intelligence and decency. However, the hero of this film is Carlo Rambaldi, who created E.T. It is almost impossible to keep in mind that the small creature is a mechanism. He expresses puzzlement, anxiety, mischief, humor, affection and loneliness with eloquent ease. In form he is very strange and continually surprising. His mind is quick and engaging and his big eyes look human. I cannot imagine how he was constructed, or what prodigies of camera trickery accomplish his performance, and I hope no one undertakes to enlighten me. I’ve long since given up my belief in poltergeists, but for a while I’d like to believe in E.T.